The first game of the season (pre-season) ends with a New York Rangers victory filled with many hungry young kids looking to impress management by throwing themselves into the nearest NJ Devil. Sean Avery taking out his teammate of four months ago, Kevin Weekes, is now the first-string backup to that Marty Fella. As expected, Avery made his presence known and again showed his affinity toward New Jersey goalies. 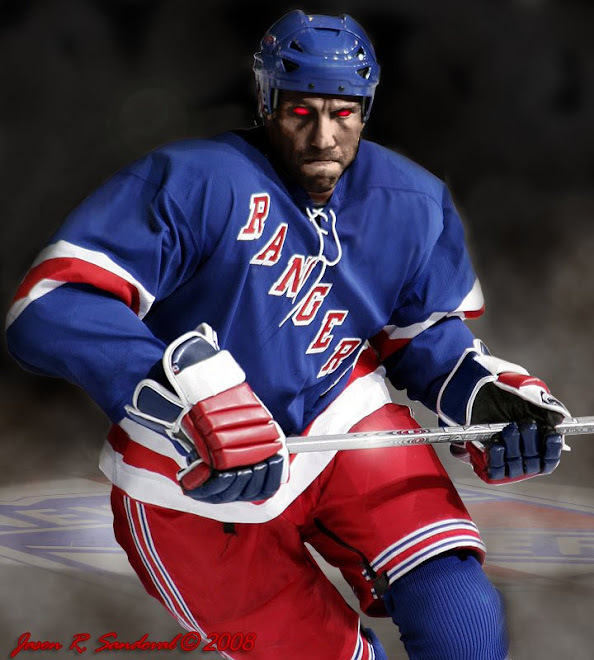 Kevin Weekes was taken out of the game due to (temporary) injuries caused by Avery. Ryan Callahan had a goal and an assist. Dane Byers, Blair Betts and Martin Straka also scored for the Rangers, while Al Montoya stopped 12-of-13 shots. On the Devils end, Brian Gionta posted a goal and an assist for the Devils. I love Ryan Callahan -- he pulled a Brian Leetch on that second goal and it is inspiring to see some of our starters playing toward the net. Perhaps perimeter play is a thing of the past. Tomorrow, the debut of Scott Gomez, Chris Drury and our Captain Jagr playing on the ice tomorrow against my favorite Philadelphia Flyers. Have I mentioned how much I dislike the orange and black? Some of your youngins look pretty good. New York has a promising future, though I do worry about your guys' defense this season. Then again, the entire Atlantic has sub par defense, so it may really just be a moot point. I cannot disagree with you on certain Avery comments and the state of defence in the Atlantic Division. The pre-season is not the time and place for hitting goalies, if ever a time - I am sure Sean is overcompensating for the nature of his tenacious free agent negotiations this summer. Prove to his teammates, but more importantly the fan base, that he is still the bully of Broadway. I have a feeling he will get seriously hurt this season. Hope not. You've got a point when it comes to Avery. He definitely looks like he wants to prove something out there. I wish he didn't have to drive the point so hard, he is a helluva player and like I said, he's got Claude Lemieux syndrome -- you HATE the guy unless he's on your team, then you absolutely love him...and if he's not on your team, you bash him 'til no end, yet secretly wish he was on your side. Kaspar was awful last night. It's too bad, he's not that old, but it seems like he just doesn't have much left in the tank. Like Avery, he was trying waaaay hard to prove a point, but he missed the mark. Always up for the challenge...let me know what you have in mind.